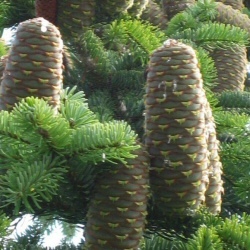 Buy Nordmann or Caucasian Fir Trees (Abies Nordmanianna) online from UK fir tree supplier of cell grown hedges and trees. If you are looking to buy Nordmann Fir for a Christmas tree plantation, then you will be pleased to know that the seeds used to grow them have been selected from trees that have a good shape to them already with the theory being that the new trees will also carry a good shape too. The height of the Abies Nordmann you receive will depend on the weather we have had previously and when in the year you buy but they will usually always be 1-2 years old. Unlike our other fir trees, Nordmann Fir or Caucasian Fir (Abies nordmanniana) is native to North East Turkey and the Caucasian Mountain area. A frequently planted tree, it is perhaps most well-known as a Christmas tree. Popular as it has an attractive, compact form and as far as a Christmas tree, excellent needle retention abilities. It however makes a fine ornamental tree with tiered branches that gracefully tiered barnch whorls coupled with shiny green leaves. Expect a final height of 42m (140ft). Expect Nordmann fir to be ready for harvesting at around 7-8 years as they will be around 6ft tall by then. Picea Abies is earlier at around 5 years but they shed their needles like it is going out of fashion. Best to plant in an area 1 metre square that has the weeds or other growth removed or kept down with a strimmer, paying particular attention not to chop the sapling in half of course. Our Nordmann Fir shares characteristics with some gypsies in that it doesn't really care what soil it sits on. As with the afore mentioned group, it also does not like standing water. They will tolerate damp soils but not long term waterlogged or boggy conditions. This is a disease that causes the needles to fall off. Affecting trees in US and Europe for the last 20 years, it was first noticed in the UK around 2009 (source daily mail so take that with a pinch/truckload of salt). The clue is in the title of the disease, current season. The attack only affects one seasons growth but that is not to say the tree will not be attacked next year. The disease causes the needles to turn yellow in July, Brown in August and then drop off. Reported failure rates from the British Tree Growers Association typically are in the 3 to 33% range however the majority have been at the lower end of the scale. Sydowia polyspora is the fungus at the root of the problem with it's potency possibly increased by unseasonal wet weather and herbicides stripping the protective wax off the needles. As of November 2012 no herbicide has been suggested as being effective. Being someone that doesn't take it lying down, I would suggest at least looking at organic alternatives. Some research has suggested planting at higher elevations could offer a small amount of protection. 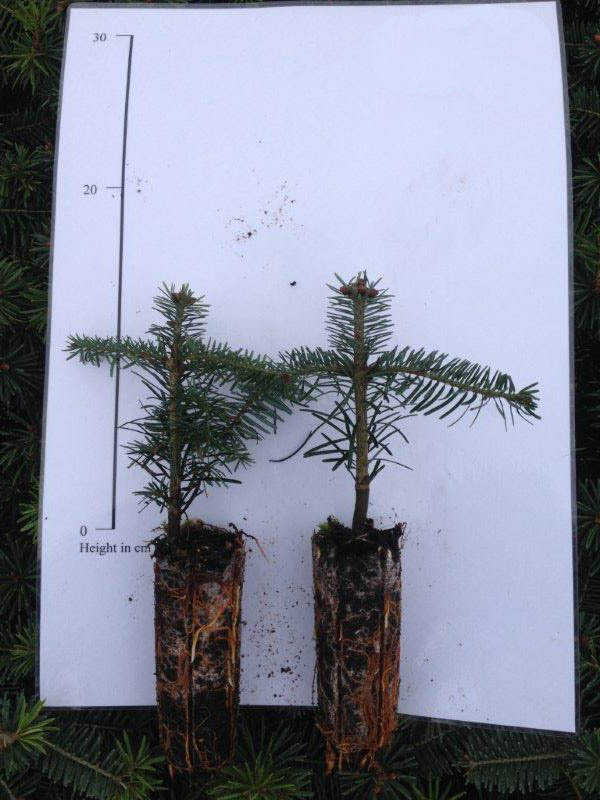 The main factor that affects Nordmann Fir tree shape is the phenotypes of the parent tree. Climate, soil type etc only has a very small influence over the shape of the tree. If planting to grow on as Christmas trees, you will need to use fencing instead of tree shelters to prevent rabbit and deer problems. This is because the tree shelters will affect the shape of the tree. Typically, Nordmann Fir may be planted as an individual tree or as an avenue of trees. Estate and Policy Woodland plantings from the 18th Century often found this tree planted along with other non-native, exotic conifer species. Today, 150 years later these trees form an amazing sight and we think that this tree worthy of planting to achieve the same effect for future generations. We offer a range of tree shelters that will protect your trees against possible attack. Click on this Tree Protection Link and it will take you to all of these products. 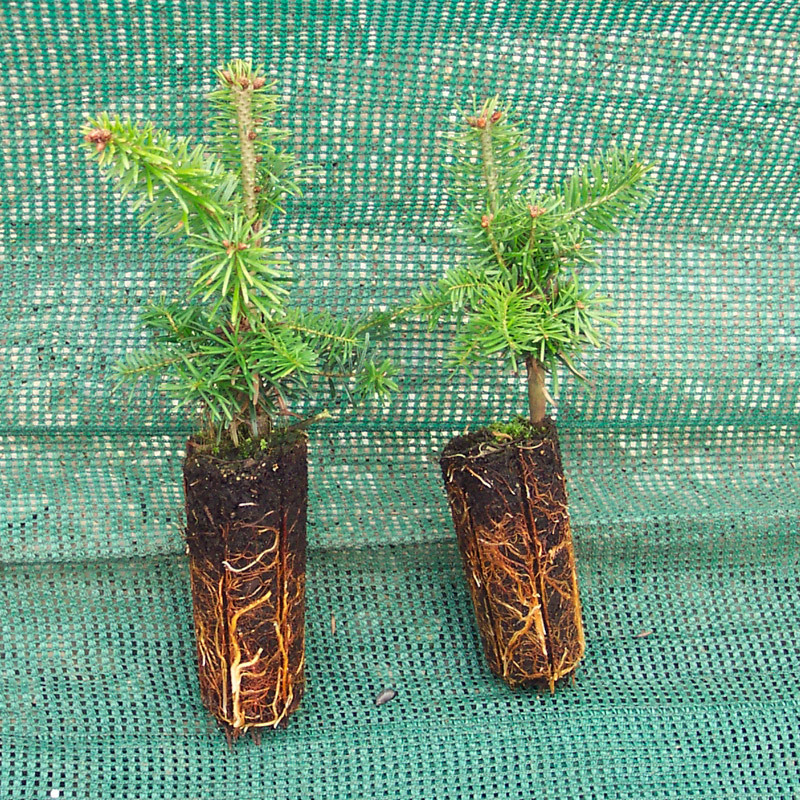 If you are growing to sell on as Christmas trees do not use the tree shelters as this will affect their ultimate shape. Best to fence the area off or trap/shoot as your rabbit protection and grow naturally. Our trees are sold as plug plants, in other words the roots are encased in compost. This means that planting can be carried out at any time of the year, provided they are watered in periods of drought, compared to bare-root plants which can only be planted during the plants normal dormant period (November to March). All of these trees are UK grown, which is important for successful establishment.